Those of you who study Tarot will know that the image of the salamander appears on 3 cards of the Rider deck, all in the suit of wands – representing the element of fire. The salamander, though, is shown only on the “royalty” cards, and not on all 4. In the Page of Wands, we see a young person contemplating the growth that is sprouting from his wand, which he holds like a staff, ready to embark on a journey. He wears a yellow tunic (symbolic of the 3rd chakra – the power center), which is covered in salamanders curving toward circles. Under the tunic, the Page has on orange leggings, the same color as the lining of his cloak. 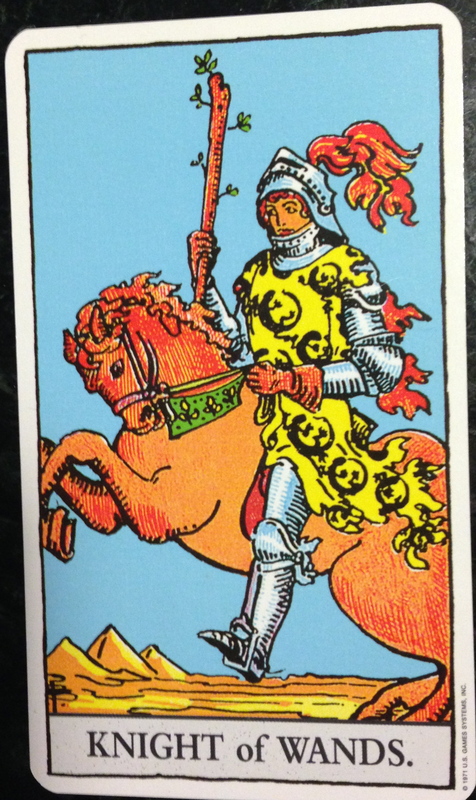 The next card in the line of royalty, the Knight of Wands, depicts a knight riding a steed, presumably toward battle. Again, we see a yellow tunic with salamanders, some of which are now forming complete circles, connecting tails to heads. The figure has moved from the point of contemplation that we see in the Page card, to action. The color orange, symbolic of the 2nd, or sacral, chakra, appears on the steed, as well as in flaming plumes emerging from the knight’s back and head. The 2nd chakra is where we house the energy of creation, both sexual and artistic. From this energy center, which exists between our tailbone and our solar plexus, we give birth to our unique gifts. When our 2nd chakra is healthy, we glow with the fire of creation. We have a healthy, and satisfying sexual life and are manifesting our innate creative gifts. The salamander itself, has long been considered the animal symbol of fire. Some species of salamander, the type we associate with the elemental symbol of fire, are a bright orange. Often we see them appear in the woods, or in our walking paths, after it has rained and the earth is still damp. These silent, harmless creatures, look like curls of flame on the forest floor, and we must watch our step carefully so as not to trod on them. The lithe body of the salamander also evokes the element of fire, with its ability to bend and twist with a stealth-like ease as it crawls across the ground. It’s moist skin reminds us that fire often needs the element of water to temper its heat. When we have too much fire energy inside of us, we can literally feel a burning in our second chakra. Sometimes this burning is a call to put our creative gifts into action, sometimes it reminds us of a balance lost. When an individual has suffered sexual abuse, or is sexually obsessed (which can be a side-effect of sexual abuse) the second chakra will often appear over-inflamed. With the second chakra, as with any of our energy centers, it is always a question of finding that healthy balance. An over-expressed chakra can create havoc, while a stagnant chakra can lead to lethargy and, in the case of the second chakra in particular, a loss of appetite for pleasure and a lack of vibrancy in one’s aura. When I opened up my deck of Rider Tarot cards I was initially surprised to see that the image of the salamander appeared on the Page, Knight and King (image later in post) cards, but not on the Queen. Unlike in your average deck of cards, the King in Tarot does not “trump” the Queen card, in fact, I often find that the Queen cards symbolize a more balanced energy representative of the suit. 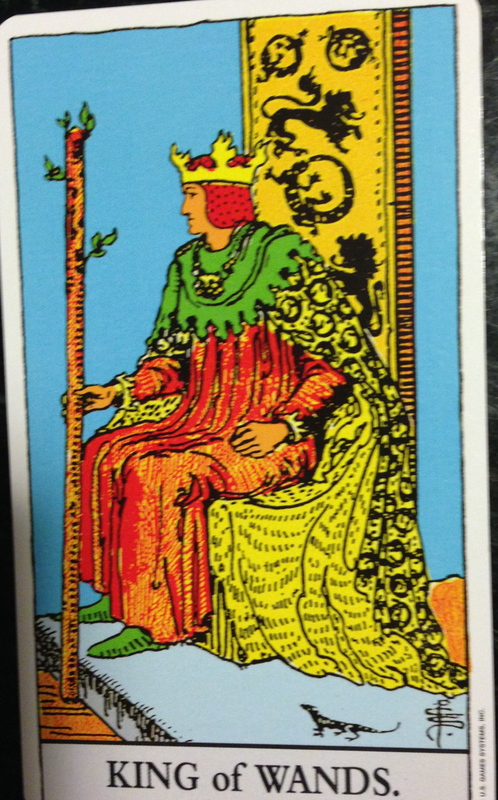 In the Queen of Wands in the Rider deck, we find a woman/queen sitting on a throne with her legs relaxed and spread out to the sides. Her “relaxed” posture shows us that her 2nd chakra is unrestricted. The animals featured in the card include the lion, fox and cat. Two of the three lions are yellow, as is the robe and crown of the queen, symbolic of the 3rd charka, the seat of our inner power. The fox is red/orange, evoking the 1st and 2nd chakras – another indication of the comfortable, fearless aura of the queen. In her hands she holds her wand (in bloom) and a sunflower – a symbol of the birth of one’s creative and sexual self (the fertilized seed’s growth into a flower). Then there’s the black cat, sitting at her feet. When I was at Goddard College, I took a tarot workshop with Rachel Pollack, and I remember her telling us that she associates herself with the Queen of Wands card. Once, when Pollack was giving tarot workshops overseas, a black cat suddenly appeared and sat at her feet while she spoke, then, just as quietly, left when she was finished. The cat, especially the black cat, is associated with feminine mystery and magic. One can’t help but feel the feminine and creative power of this card, yet it is not over-welming or threatening. 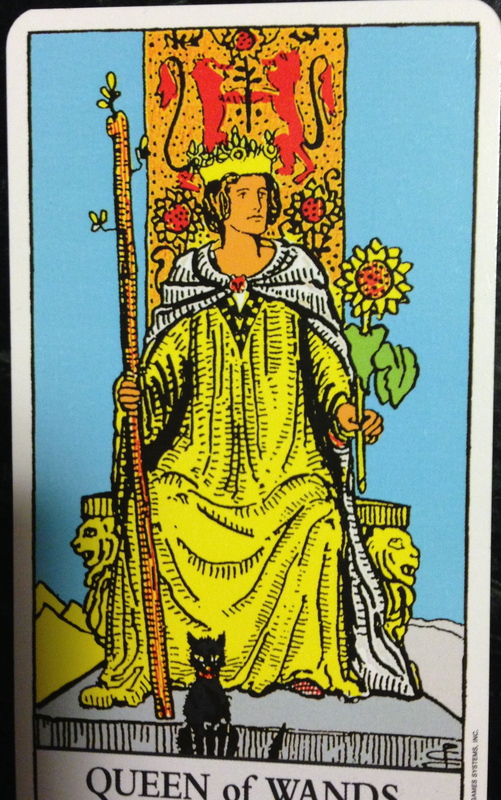 Now, maybe it’s just me, but the figure in the King of Wands card looks a bit disgruntled, and dare I say a bit angry. Although he is seated, he appears ready to stand, his gaze turned toward an unknown source that may be troubling him. 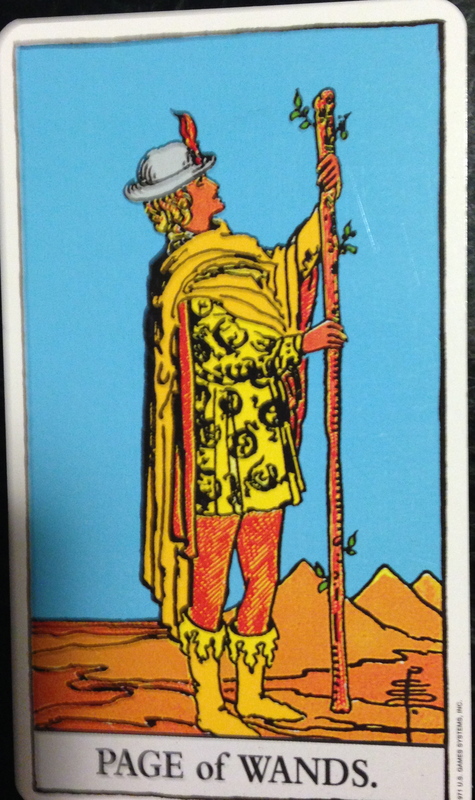 His left hand (the hand that held the sunflower in the Queen of Wands), is partially clenched and the arm is pulled back as though readying itself to support the king’s posture to stand. The element of fire is everywhere in the picture. The King’s hair is a red/orange, as is his dress. His yellow crown bares the tips that look like flames, and the salamander has reappeared. Instead of a cat at his feet, we see a salamander off to the side. On the back of his throne and on the outer layer of his cloak, there are salamanders curled into circles. One can’t help but think that the king has not only mastered this element, but perhaps has over-mastered it to the point where there is an imbalance – or too much heat in the second chakra. 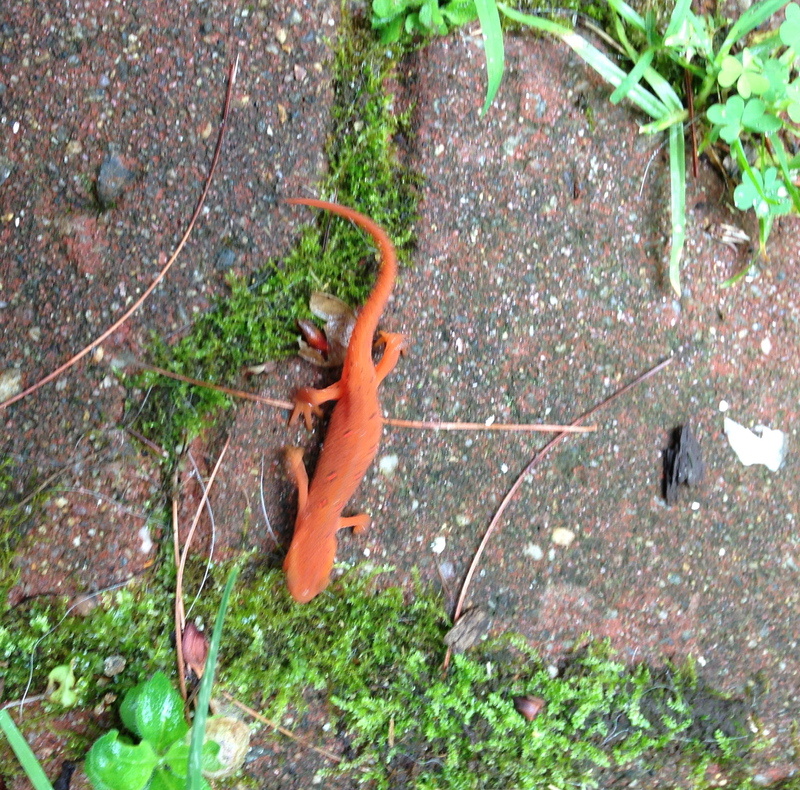 Twice in recent days, an orange salamander has appeared on my path. It’s small, flame-like body reminding me to go within and assess what 2nd chakra energies are calling for balance, for voice and for healing. It’s a reminder that sometimes we need a bit of fire to burn off the emotional element of water, and to spur our desires into action. My salamander, after all, came after rain. This entry was posted in Animal Messengers, Energy Healing, Gaia & Elementals, Reflections and tagged Rachel Pollack, rider tarot, sacral chakra, Salamander symbology, second chakra, tarot, Wands cards in Tarot. Bookmark the permalink. I like the way you tie in the chakras to the colours in the cards. Very inspiring for my work!! I really enjoyed that, Alethea. I used to do a lot of Tarot, using the Case cards, in my Qabala days. Enjoyed this read linking salamanders and tarot Alethea – thank you! Thank you, Trish. Not on the Tarot, but I have a memoir out, A Girl Named Truth. Fire is my favorite element – it is the desire within that burns…. I like how fire can consume and transform and yet it can also be warming and provide the light. Love the article and the blog which Sue (Vincent) pointed me to…. Thank you for visiting my blog 🙂 I’m glad you enjoyed the post. I agree​, the element of fire can have some pretty transformative effects, and sometimes very rapid. Thank-you so much for all the information. I dabble in tarot, but know much more about the energies of the body. I am a water so fire is my opposite and I find it very interesting. Thank you for reading. I find I hardly use tarot anymore, but it was a more central part of my life when I wrote this post. I enjoy symbolism, though, and the cards are so layered with it. A lovely post very informative, Alethea. I don’t know much about the reading of tarot cards but love your explanation and how you focused much on colours and the salamander..Really well written.